Ozone is a natural purifier created in nature by the combination of oxygen in air and the ultraviolet rays of the sun or by the corona discharge during a lightning storm. Ozone has a clean, fresh scent noticed after a rainstorm. 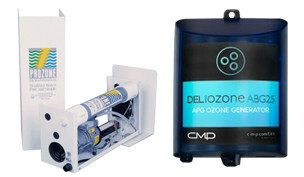 Ozone is the alternative water purifier to traditional chemicals such as chlorine and bromine. The Ozonators will keep your water clean and sparkling clear, by destroying bacteria, viruses, mold, and mildew. The ozonators do all of this and is still gentle on your skin and eyes.